Are you looking for the best of plumbers in Nantwich? Are you tired of dealing with unreliable plumbers who charge ridiculous rates for their services? Well look no further than Cheshire Plumbers! We provide professional plumbing services to Nantwich and the entire surrounding areas and have built a reputation on being the best plumbers in Nantwich. We pride ourselves on being reliable and dedicated and on providing cost effective services to homeowners and commercial property owners in the area. At Cheshire Plumbers, we specialise in helping you no matter what type of plumbing system you’re working with. We work with both domestic and commercial customers and are equipped to complete a whole host of projects which includes bathroom installations, gas fitting, fitting solar panels and fitting underfloor heating. When considering which heating solutions to implement in your premises, a popular option is solar heating. Today solar heating is growing in popularity due to its money and energy saving nature – as premier plumbers in Nantwich we offer an expert fitting and maintenance service for solar powered systems. In addition to our plumbing and solar power services, we also specialise in fitting and maintaining underfloor heating systems. Underfloor heating systems consist of high tech plastic pipes placed below the floor to give a surface temperature of 25-28 degrees. They are very low maintenance but should your underfloor heating run into problems, our plumbers in Nantwich provide expert underfloor heating leak detection and will have your heating running efficiently as fast as possible. Finally, at Cheshire Plumbers, we also specialise in pipe leak detection and central heating leak detection. Our expert plumbers in Nantwich use the latest thermal imaging technology to locate your leak quickly and easily. 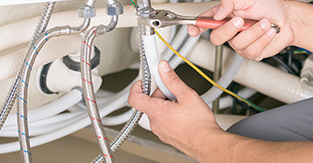 If you are concerned that you have a leak, please don’t leave it to chance, call us today to speak to a member of our experienced and reliable team! As one of the best plumbers in Nantwich, we’re on hand to help you whenever you may need our services. To read more about our services, explore the rest of our website. We’re always happy to help our customers in person. For any questions, queries, or a personalised quote, get in touch!